Dwi Putri Ratnasari, our staff, is in the assignment on Komodo Island, NTT. She will cover the wild life of ancient animal, the Komodo dragon, for five days between 28 November to 3 December 2010. 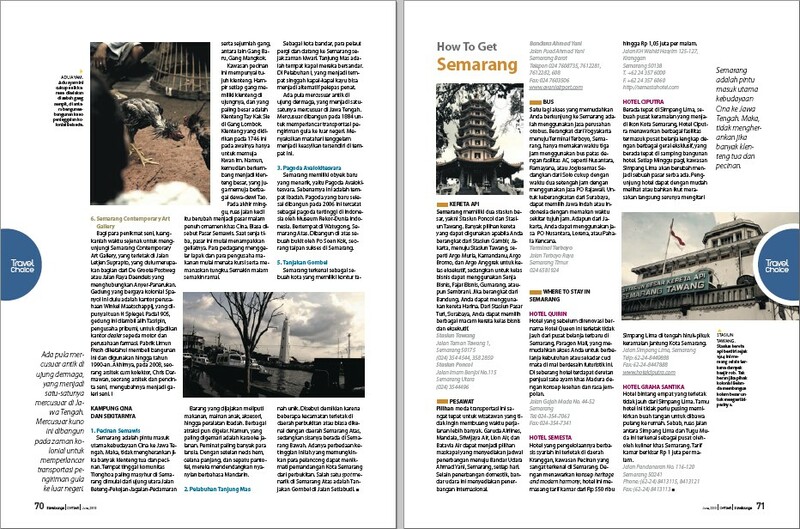 Assignment is done by the Ministry of Culture and Tourism Republic of Indonesia. Preparation can take place up to three months, all the villagers comes a part. Afternoon has not yet drown when I Wayan Japa led a large group of people who marched across the village of Sayan, Ubud, Bali. The large procession consisted of children to adults. Teenage girl walking neatly with colorful traditional outfits, with Banten or offerings on their heads. Families bring their sacred objects which are ancestral heritage. Male teenagers from all over the village who can play music accompanied the group by forming an orchestra, walked and hummed an energetic Balinese from the gamelan instruments. Small children are assigned to carry flags with specific symbols. In the procession there are also some Hindu religious leaders, pedanda and pemangku, using white clothes typical of Hinduism. They looked magnificent in their Balinese outfits, even the group of small children who joined the group did not forget to wear headbands, and sarong. The destination of the group is the village water source. They will walk up and down the beautiful rice terraces. Ubud is famous for using the land terracing systems. 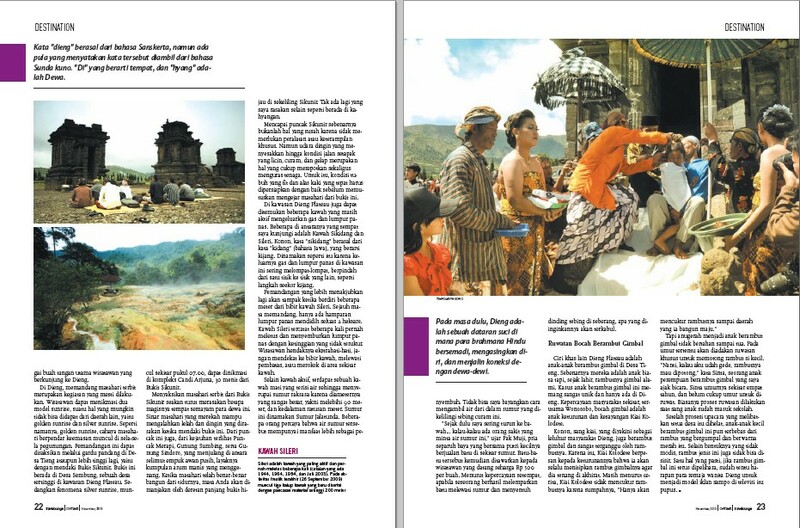 Reminds us of the movie The Fall directed by Tarsem Singh that used the rice fields of Ubud as one of the backgrounds. The small and winding roads did not make the group of grandmothers in the group becomes fatigue.Their wrinkled legs could still step lightly and relaxed, even when the group must pass through hilly areas. They looked energetic and could still walk among the rice field without assistance. “I am used to, from a young age I already participated in this procession, “said a man. Hills with the grass savanna as high as the waist which swayed following the direction of the wind becomes their destination. On the other side, there is the Ayung River and its tributaries where the water are clear, winding dividing the hills. Rice fields decorate the slopes in the opposite hill. Coconut and banana trees add beauty to the landscape. At this point the group stopped, make a single line in order to cross. The bridge is very simple, only two pieces of bamboo stems intact. This bridge crosses the Ayung River, a favorite place to do rafting in Ubud. Finally they arrived at a spring, the Balinese call it Beji. They also perform a ritual called the mebejian, a procession to get holly water that will be used to bless the entire family. Previously, this group forms a large circle with the center of a small old temple. 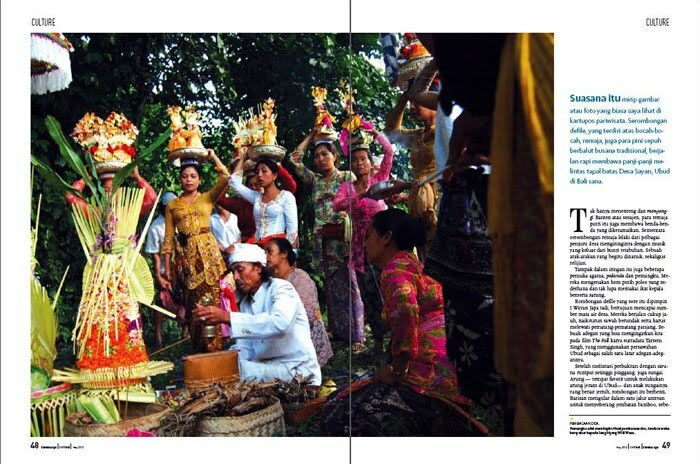 Under the leafy shade of bamboo, the pemangku (religious leader) leads a ritual recitation of prayer, in order to state their gratitude to Sang Hyang Widi Wasa. Instead the small children were engrossed in waterplay in the small lake beside the springs. Mebejian is none other than a part of the Odalan ceremony or birthday of the temple. Bali where the majority of the population are Hindus choose an easy to find location for the temple as a place of worship. At home in the small to large sizes. Almost every village in Bali has three temples, Pura Dalem for matters relating to the death, Pura Puseh or temple of origin, and Pura Bale Agung devoted to the gods. Each family also has their own temple in the courtyard, usually called sanggah or mrajan. There is also Pura Dadia used by large families. Please count how many temples in Bali. It is only natural if Bali, one of the most beautiful islands in the world is called the island of thousand temples, although the number of temples has certainly reached more than a thousand. The odalan ceremony, also called piodalan, an anniversary ceremony of the temple. Odalan is a marker when a temple was built and the gods were invited into it. There are two types of the odalan ceremony, which is a big odalan ceremony or also called the Odalana Madudus Agung conducted for four days, and a small odalan ceremony or odalan alit which is held only one day. A special odalan ceremony can last until one week. Each temple celebrates a small odalan ceremony once every 210 days, or every seven months in the Gregorian calendar. Balinese calendar has different amount of months and different amount of days than the Gregorian calender. The big odalan ceremony has a longer cycle. 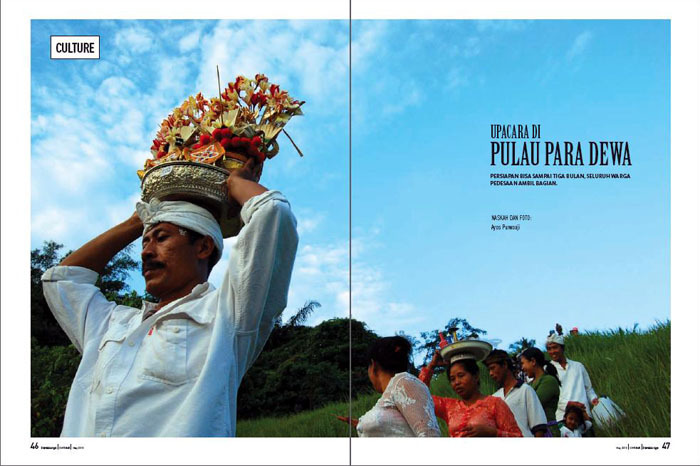 Odalan Eka Dasa Rudra, the largest odalan ceremony to commemorate the anniversary of Pura Besakih is only held once in a hundred years. At one time odalan can be done almost every day. In general, there are actually four phases in performing an odalan ceremony. 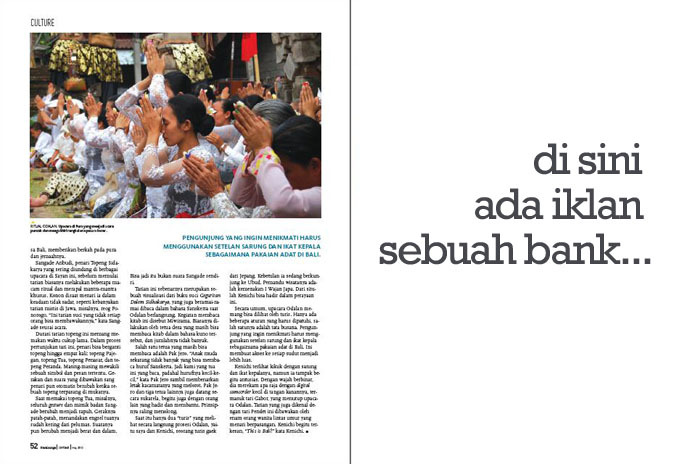 The procession lasts only for four days, but the preparations made by the family of I Wayan Japa took nearly three months. The first ritual is the Sanctification, the concept is more emphasized on efforts to get rid of things that are considered bad and dirty. Next ritual is Mendak Tirta, a number of senior family members go and get holy water in the Great Pura Besakih. The third ritual is Mebejian which takes place in the village fountain. The last ritual is Odalan, this is the top event that ends the series of this great ceremony. Do not ask the cost of the ceremony, on average each family spends tens of millions of rupiah for such a grand event. Between one step of the ceremony to another separated by a day. A ritual is held according to the calculation on when the good day is, which is calculated by the pedanda. Determination of good days from the calculation using the traditional calendar is the authority of the pedanda. In the structure of Balinese society, pedanda is a very important entity. odalan takes place for many months. But all that burden he does not bear alone. 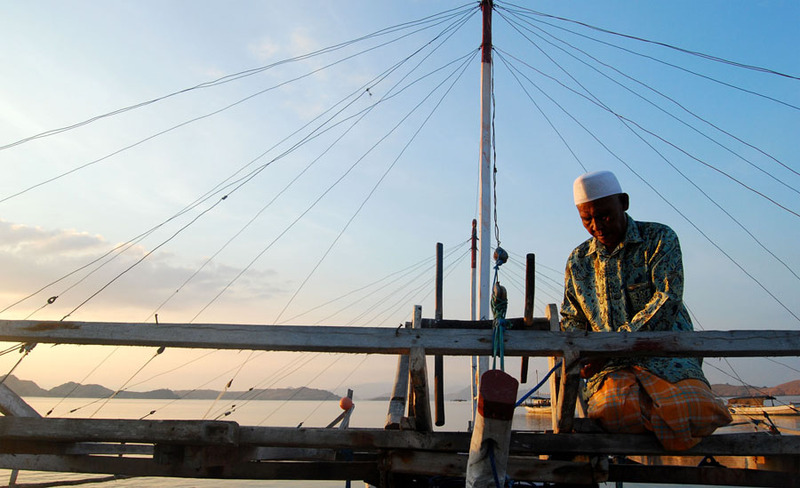 “All of the citizens of banjar help, making the preparations easier. No one asked for money, all voluntary, “he said. It was very noticeable that in the preparation the villagers come to work when the Odalan takes place. Everyone was busy. Not to mention the ladies who does not stop to decorate every corner of the house with decorations. The decorations they make shows strongly of the Balinese characteristics; umbrella for ceremonies, red rerumbai, bamboo container, colorful offerings, shiny white cloth, golden yellow cloth, and hats made from yellow coconut leaves for the young dancers. They also put the offerings in the form of food and fruits on some beautiful sculpted metal container. The youths who are assigned to play music incessantly plays the beautiful bleganjur composition. Actually, these young people is a group of Balinese people who play the gamelan instruments and usually performs at the Four Season Resort, Ubud. But for the odalan ceremony, they gladly lend a hand. “We do not have to be paid, we are already pleased if food are provided,” said Subakta, flutist in the group. For the preparation of this Odalan, Bli Kerta has not slept for three days and three nights. He becomes the most busy person on big odalan celebration. He grills and cook all kinds of food. Even all of the seasoning was made by his own hand. Luckily he is a fitness instructor at a fitness center in Ubud, so no need to doubt his stamina. “But if wine is not available, maybe I’ve passed out from yesterday. Drinking wine makes me awake, “said Bli Kerta while fanning his satay. All the dishes made by Bli Kerta is intended for Sanghyang Widi Wasa, but in the end of the ceremony, after all piodalan procession is completed, all of these servings can be eaten by the guests who attend. It is a big party. All will run out quickly, including the satays that were fanned by Bli Kerta all day long. That is also the reason why Odalan should not be missed, because food is so abundant. 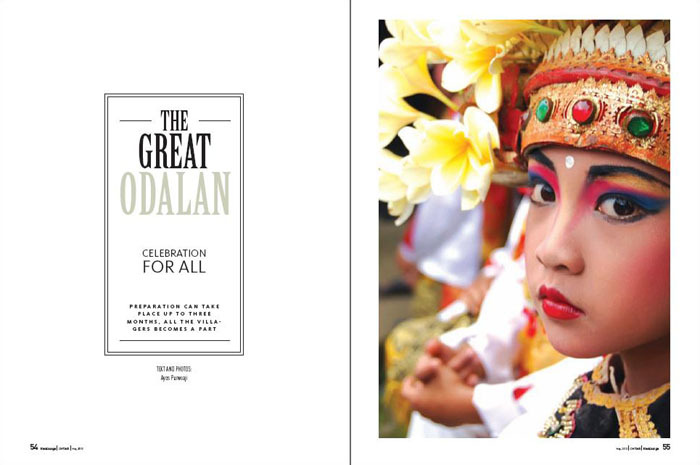 Odalan can not be separated from the Balinese dance and other Balinese cultures. At the time when the big Odalan takes place, several dances are demonstrated, one of the dance is Rejang Dewa dance, a sacred dance that can only be performed by women who are still pure. The number of dancers is eight and all of them are small children. Their bodies are covered with a yellow traditional outfit and they wear a hat of plaited yellow coconut leaves. Very beautiful. This dance is a dance to welcome the gods who come to bless the ceremony. The next dance is the Sidokarya mask dance, this is also sacred, but more magical and philosophical. Tells us about a god who incarnated in the figure of a wise old man, giving a lecture in the language of Bali which essentially gives a blessing at the temple and the people who prays in the temple. Beneath this old mask there is the face of Aribudi Sangade, a Sidakarya Mask dancer who is often invited on various ceremonies at Sayan. Before beginning to perform this dance Sangade conducts various kinds of rituals and chanting special incantations with the Sidakarya mask placed in front of him. Maybe he was dancing in a trance, like most mystical dances in Java, namely the reog Ponorogo. “This sacred dance not everyone can perform,” said Sangade after the event is finished. This mask dance performs in a long period of time. There is not only one mask, but can be changed up to four times; Topeng Pajegan, Topeng Tua, Topeng Penasar, and Topeng Peranda. Each mask represents a symbol and a particular message. The movement and sound of Sangade will automatically change when a face mask attached. When wearing the Topeng Tua mask for example, the whole body gesture and expression Sangade become brittle. The halting movements symbolizes the dry old bones. His voice turned heavy and deep. It is possible that it is not Sangade’s own voice. This dance is actually a visualization of the holy book Geguritan Dalem Sidhakary which is read together in Sanskrit language when the odalan ceremony takes place. This activity to read the holly book is called Miwirama. Usually carried out by village elders who can still read these books in the ancient language, there are not many of them. One of the elders who can still read is Mr Jero.”There are not many young people nowadays who can read the Sanskrit letters, therefore we the old ones are the one who would read, whereas the letters are very small,” said Mr. Jero while his glasses are slipping. Mr. Jero and three other elders also came voluntarily, as well as others who attended and helped. The principle is to help each other. 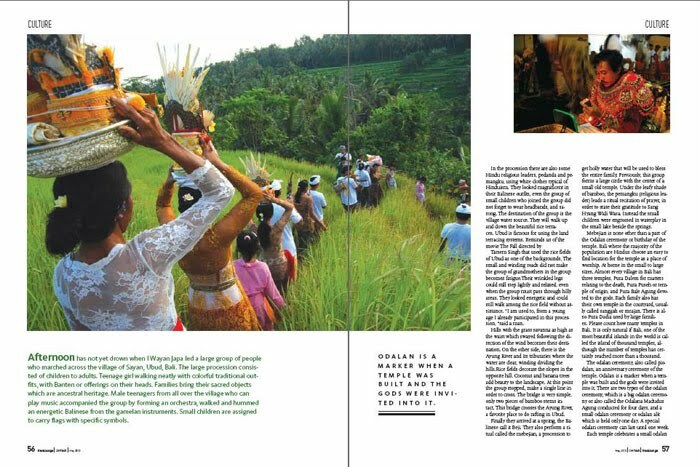 The beauty of the Balinese community is still clearly visible here, away from materialism and modernity. An ancient face but always missed. At that time there are only two tourists who saw firsthand the odalan ceremony, that is me and Kenichi, a Japanese tourists. Incidentally he was visiting Ubud. The tour guide was the niece of I Wayan Japa, that is why Kenichi can be present in this celebration. In general, the odalan ceremony can be viewed tourists. But there are some things that must be maintained, one of which is the outfit. 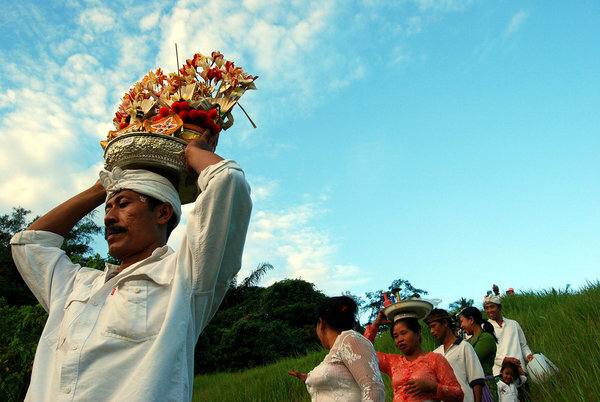 Visitors who want to see the ceremony need to use gloves and Balinese headbands. This makes access to every corner becomes wider. Kenichi looks awkward with gloves and headband, but he was so enthusiastic, his face lit up and he recorded everything with a small digital camcorder in his right hand, including the closing dance which is the Gabor dance. This dance is also known as Pendet dance and was held by six women with various age who danced in pairs. Kenichi was so impressed, “This is Bali!,” Said Kenichi. Located in one of the highest plateaus in the world, with local wisdoms that have stood against the test of time. The bus I was riding from the Wonosobo market started to moving up and bouncing, shaking its passengers and loads, waking me up from my sleep. When I squinted my eyes out the window, I saw a spectacular view: a narrow gorge with layers of flanks filled with colorful fields. Cotton candy clouds above seemed so close that I felt like I could touch them with my hand. In a short while, I had been refreshed and starting to fantasize that I was in New Zealand, a country full of fertile land and sheeps that I often see on television. But the sound of the bus cracking and rows of people with bright-skinned and pink cheeks on the street interrupted my reverie. Instantly, I realized the reality that I was still in Java, on the Dieng plateau, Wonosobo to be exact. I looked out once again, observing the local people, who are mostly medium height with brown skin and slanted eyes. “There are villages whose population tend to have slanted eyes since we were in deed descendants of Chinese people,” said a slanted eye Dieng woman who sat next to me. At three o’clock, the normal temperature on the plateau is around 5-15 degree Celsius, but it would decline to an extreme zero degree upon entering dry season. In August, according to Bu Siti, the owner of the homestay in Dieng Kulon, grass would look like ice bar. Located at an altitude of more than 2,000 meters above sea level, the Dieng Plateau is one of the highest plateau in the world, second only to the Tibetan Plateau in Nepal. From a distance Dieng looks like a giant saucer surrounded by hills and mountains. And at 2093 meters above sea level, the temperature in Dieng is always cold. When the dusk comes, fog begins to fall from the top of the mountain. By the time the sun sets, the whole area has been filled with fog. It’s so cold. Wearing thick jacket is a must if you want to fight the cold. But the locals prefer to cover their bodies with sarong, while their faces covered with checkered pattern cloth. Their look is similar to the description of the Sawang people in Rainbow Troop (Laskar Pelangi) novel that I got to think, the sea and the mountain people are actually the same: they love to hide under their sarong. 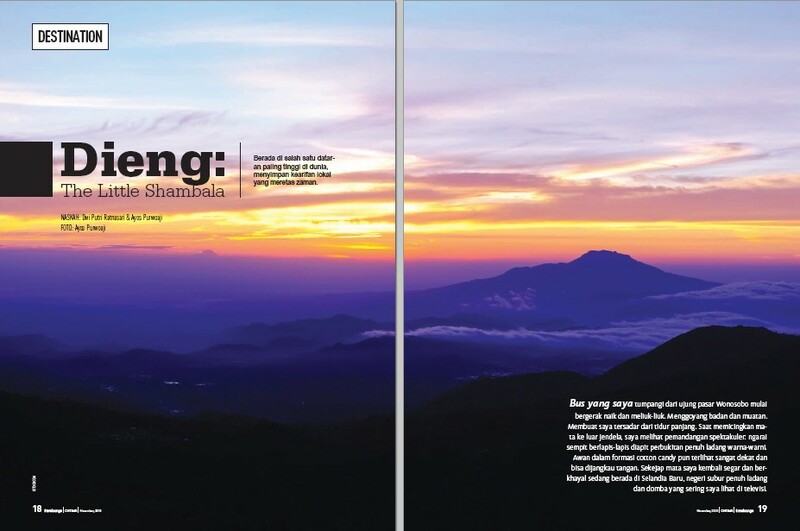 Some sources say that the word “Dieng” comes from Sanskrit, but others say that it comes from ancient Sundanese. “Di” means place, and “hyang” is God. Perhaps the plateau is called ‘Dieng’ because it is the most fitting place for gods and men to meet. It is in deed close to the sky, but hermits can still reach the place. In fact, there was a time when this area was a sacred ground where Hindu Brahmins went to meditate, self-isolating themselves to establish a connection with the gods and goddesses. Once, Dieng was the most popular place for young hermits to forge their souls. Traces of history can still be seen today. One of them is the reconstruction of a hut that was used to be the place where the Brahmins took a rest. This place is located in the courtyard of Candi Arjuna. I imagined the place as Shambala, the holy city sought after by medieval adventurers. A legendary dwelling for holy men with no worldly needs, a miniature of heaven on earth, a utopia. In his novel The Secret of Shambala, James Redfield described the city above the cloud as a city of eternal peace and pure knowledge that can only be reached by the real seekers of truth. 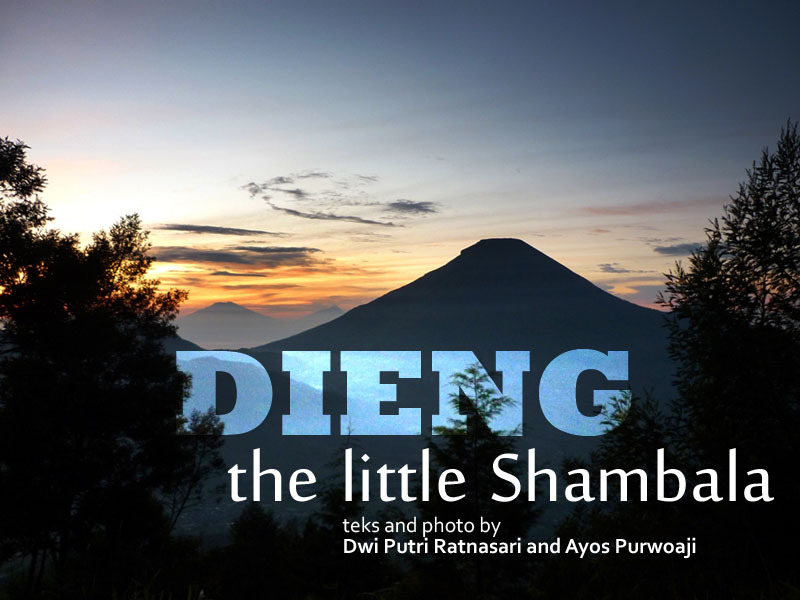 I could feel the aura of little Shambala in Dieng. Especially since the beautiful and magical sound of tabla played by Ravi Shankar and Deepak Ram was on heavy rotation at my MP3 player throughout my trip, providing an eerie magical aura of Dieng. No doubt, this is the perfect place for New Agers to spend time to meditate. But now not only the pilgrims come to Dieng, many tourists also visit the place. The plateau region has long been a popular vacation spot, as exemplified in a song from Serat Centhini, an ancient Javanese literature written in the 19th century. The ancient letter had also informed us of the existence of three temples that were already lost, no one really knows their present locations, i.e. Candi Duryudana, Candi Dahyang Durna, and Candi Sakuni. In Dieng, there are many Hindu temples (candi) from the reign of Sanjaya Dynasty with names taken from the shadow puppet figures, which are based on the book of Mahabharata, such as Candi Arjuna, Candi Sembrada, Candi Srikandi, and Candi Puntadewa. There are also some other temple complexes, such as Gatotkaca and Dwarawati. From these various relics, we also learn that once Dieng people are devoted to Lord Shiva. This is visible from the temple’s reliefs and stone inscriptions, which are now displayed at Museum Kailasa. The museum hosts and preserves many cultural artifacts. It is located in front of Candi Arjuna complex and was only inaugurated by the government in 2008. The museum looks neat and clean with modern architecture. 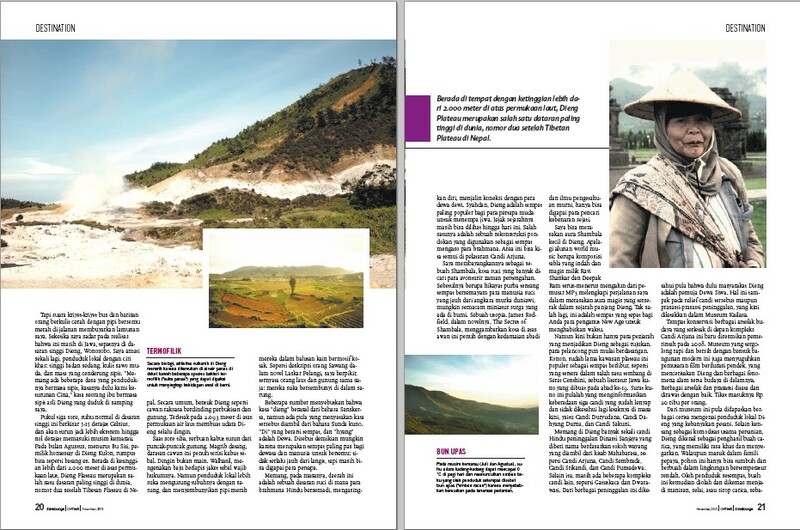 It presents short duration film screenings about Dieng and various natural and cultural phenomena around it. Various artifacts and inscriptions are arranged and preserved. The entry ticket is Rp20 thousand per person. In this museum, visitors would learn the stories about local residents, mostly Dieng farmers. In addition to potatoes as their major agricultural commodity, Dieng is also known as producer of carica fruit, which has a distinctive, refreshing taste. Although it is a member of papaya family, the carica tree can only grow and bear fruit in low temperature environment. Local people usually process the fruit into carica sweets, carica jam, or carica syrup, which are the most common gift people bring from Dieng. In Dieng, watching the sun rise is a must-do activity. People can observe two kinds of sunrise, something that may not be found elsewhere, i.e. golden sunrise and silver sunrise. As the name suggests, during golden sunrise, a golden glow of sunlight would appear from behind the mountains. The scene can be viewed from the viewing post at Tieng village, or higher if you don’t mind climbing Mount Sikunir. The hill is located at Sembung Village, the highest village in Dieng Plateau areas. Meanwhile the silver sunrise phenomenon occurs around seven o’clock in the morning and can be viewed at Candi Arjuna temple complex, 30 minutes from Mount Sikunir. Watching the sunrise from Mount Sikunir would make you feel the magic of the place where the gods live. Seeing the sunlight peeking from behind the mountain would chase away your tiredness and cold after climbing the mountain. From the top of Mount Sikunir, you can see Mount Merapi, Mount Sumbing, and Mount Sindoro in a distance, standing tall and blanketed by soft white cotton candy-like clouds. When the sun has fully arisen from its deep slumber, your eyes will be spoiled with long line of green hills surrounding Mount Sikunir. I felt like I was in paradise. To reach the top of Mount Sikunir is not difficult. It does not require special equipment or skills. But stinging cold air and slippery, steep trail that you had to take in the dark in order to get to the top made the journey somewhat daunting and downright exhausting. You must be physically fit and wearing proper footwear before deciding to pursue the sunrise view from the top of the mountain. In Dieng Plateau area we can also findseveral active craters, which are still coughing gases and hot mud. I visited some of the craters, i.e. Sikidang and Sileri. People say, the word “Sikidang” comes from the word “kidang,” which in Javanese means deer. The crater is named as such because of the jumping gases and hot mud ejected by the crater, just like jumping deer. More amazing scenery can be seen when you stand a few meters from the lip of Crater Sileri. As far as your eyes could see, hot boiling muds are spread in an area of 2 hectares wide. Crater Sileri has recorded several eruptions and spewed hot mud high into the sky. Visitors should take extra care not to get too closer to the lip of the crater, or passing the barrier, or smoke in the area around the crater. Besides active craters, there is a dead one filled with water that it looks like a giant well with a very large diameter, which exceeds 90 meters, and hundreds of meters deep. The locals call the well Jalatunda. Some people believe that the water from the well has the power to heal. But I just don’t understand how people can take water from the well, which is surrounded by steep cliffs. “I used to come down the well quite often… whenever there’s a sick person who asks for water,” said Muji, a middle aged man who sell rocks around the well with her little girl. The rocks are offered to visitors for Rp 500 per piece. According to local belief, if you can throw a stone across the well and land on the other side, your wishes would come true. Another distinctive feature of Dieng Plateau is children with dreadlock hair in the village of Tieng. Actually they are ordinary children but, since birth, they have natural dreadlock hair. These dreadlock haired children are indeed very unique and curiously found only in Dieng. 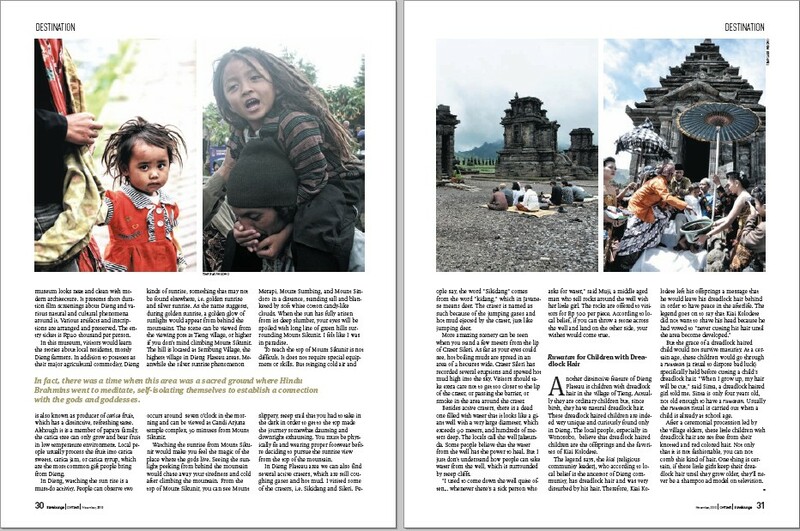 The local people, especially in Wonosobo, believe that dreadlock haired children are the offsprings and the favorites of Kiai Kolodete. But the grace of a dreadlock haired child would not survive maturity. At a certain age, these children would go through a ruwatan (a ritual to dispose bad luck) specifically held before cutting a child’s dreadlock hair. “When I grow up, my hair will be cut,” said Sinta, a dreadlock haired girl told me. Sinta is only four years old, not old enough to have a ruwatan. Usually the ruwatan ritual is carried out when a child is already at school age. 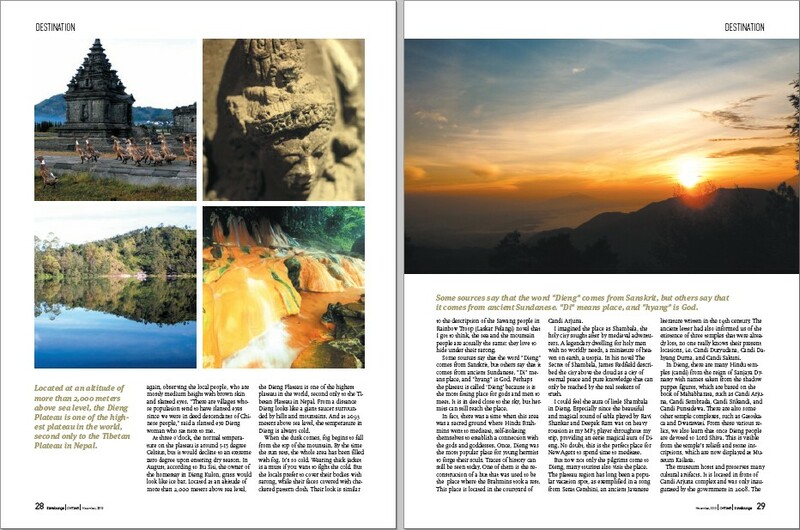 Our separated travel journal to Dieng Plateau has been featured in Travelounge Magz 2010 November edition. 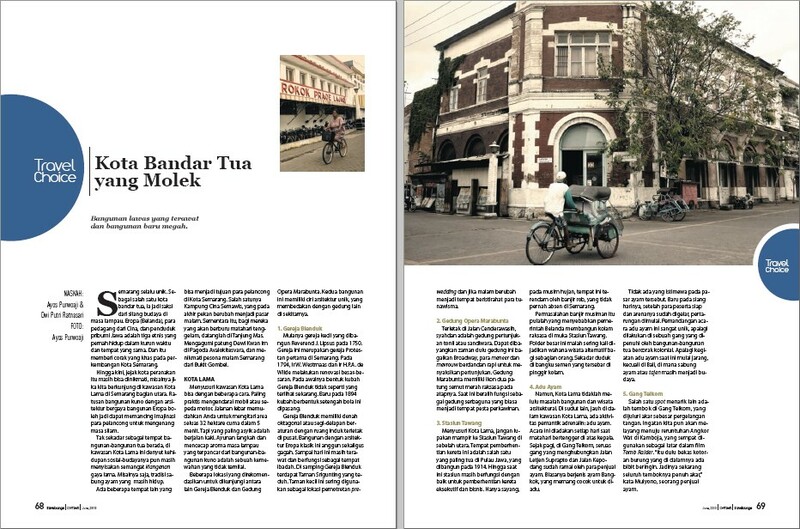 Our feature and guide to Semarang Old Town appear on Travelounge Magz 2010 June edition. 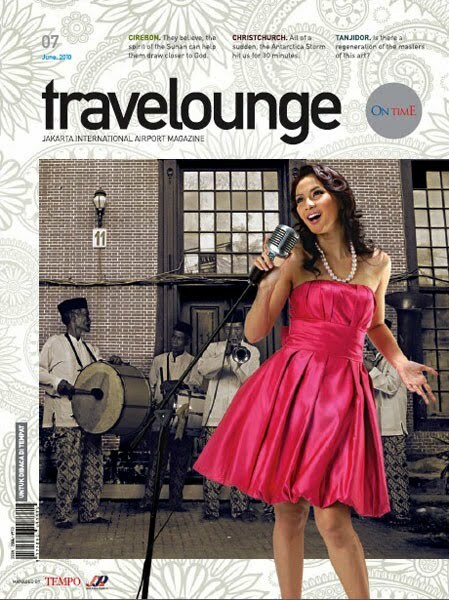 My feature about Great Odalan Ceremony in Ubud was published on Travelounge Magz 2010 May Edition. Travel boogie adalah kami. 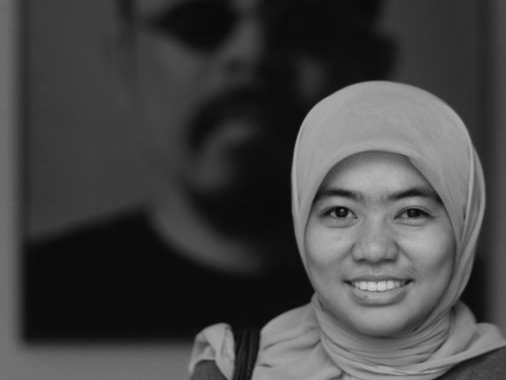 Dua orang pecinta jalan dan menulis jurnal. 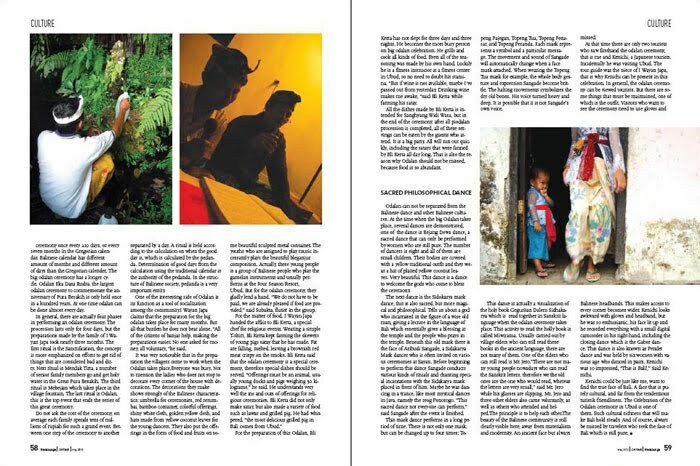 Blog ini adalah kumpulan travel journal yang kami tulis dengan serius dan niat tulus.